Families owning houses all across the United States are fearful of the possible scenario of having asbestos and asbestos-embedded materials lurking around their safe havens. Such probability is considerably higher when the buildings in question are older properties since asbestos was the miraculous mineral accommodating the needs of most industries and businesses until not too long ago. Prior to the 1980s, most public structures and private homes in the U.S. have been constructed with asbestos-based mixtures, due to its abundant availability on the one hand, and fireproofing and strengthening characteristics on the other hand. The toxic substance was officially banned in 1977 from most of its uses, however, regulations only refer to how asbestos is to be treated from that point on, without directly addressing the obvious incongruity: what about the various systems and constructions that have been built with asbestos? Confronted with such an unfortunate miscalculation, U.S. homeowners should proceed with caution in any home improvement endeavor. In the times in which DIY projects tempt the average person to give pretty much everything a try themselves, it is especially important to be vigilant about turning your home into a hazardous site. If you would like to renovate your fireplace or you believe it is in need of repair, you should be inspecting it for visible signs of deterioration and call a professional if it is indeed in a poor condition. If you want to remove it yourself, you must be extremely cautious when doing so as asbestos is extremely toxic. Read our Asbestos Removal page to find out how to deal with asbestos yourself. Asbestos cement: commonly used to patch chimneys. Chimney flues: the lining of the pipes preventing heat from escaping. Decorations: artificial ash, embers, and logs. Gas fires: might still retain original fuel texture containing asbestos. Stove gaskets: used to seal air leaks. Wood-burning stove: pads and trivets placed on top. Unless professionally instructed, it is impossible to tell for certain whether or not there are any asbestos-related pieces in your fireplace or around it. The dangerous mineral has no smell and it is not particularly easy to spot by simply using sight. The task becomes especially challenging when the material is part of other compounds, as it usually is to be found. Even if by its original intent the heating structure from your home had the purpose of converting it into a safe place for your personal refuge, the harmful materials from its composition could instead put your life in danger. Although, it should be kept in mind that simply discovering asbestos in your heating system is not enough reason to conclude that you have been exposed to the toxic mineral. 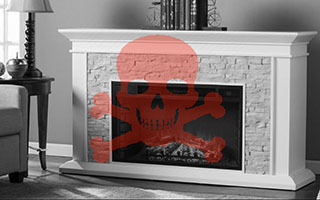 If your fireplace is in good condition and has remained intact over the years, then even if it contained asbestos, the mineral would just be stuck in the hardened compounds in which it is secured. The risks appear when the asbestos fibers are released into the air if they had been disturbed in some way, causing them to crumble and settle into dust particles that can easily be inhaled or ingested. There is no known procedure that can help the body expel asbestos once they find their way inside it. The toxic fibers will gradually cause inflammation, and decades later develop into terrible diseases, such as lung cancer or mesothelioma. Any kind of modifications you wish to make to your fireplace should take place under the supervision of a specialist that can do a proper inspection and dispose of the waste accordingly. Why Should I Test Products in My Home for Asbestos? It is often impossible to tell whether asbestos is embedded in a material, as the fibers are too small to be observed with the naked eye. Exposure to asbestos is responsible for serious respiratory conditions, so thorough testing is required to ensure your home is asbestos-free.